Editor and CEO David Rothkopf will host The Editor's Roundtable. The global affairs publication Foreign Policy stepped up its podcast game today, debuting two programs: The Editor’s Roundtable, or, The E.R., and Global Thinkers. 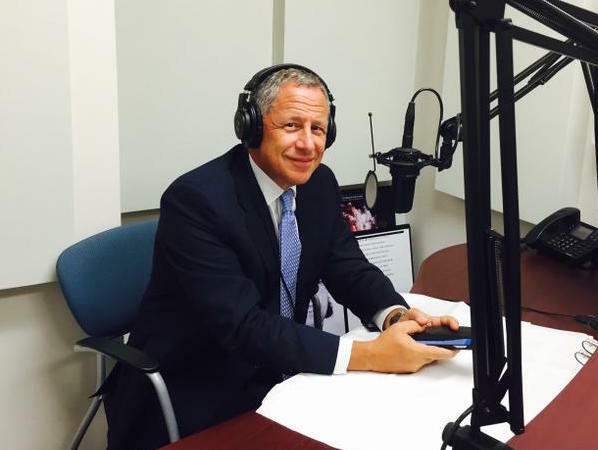 This move could be seen as part of a larger theme of digital innovation by FP’s editor and CEO David Rothkopf (pictured at right in the new FP studio). FP revamped its website in 2013 as part of a “top-to-bottom retool” and has continued adding to the site everyday, according to executive editor Benjamin Pauker. The E.R., nicknamed so, according to an announcement, for its “emergency room-like urgency, expertise and a bit of mayhem,” will be hosted by Rothkopf. He and his guests, who will include some regular FP contributors like Rosa Brooks and Kori Schake, will discuss the day’s big issues and possible life-saving actions. Global Thinkers, drawing its name and concept from FP’s much-read annual issue, will have a much more spontaneous format and will be hosted by a rotating cast of FP editors and reporters who will discuss larger trends, issues and arguments with their guests. The premiere episode features Nobel Prize winner Malala Yousafzai discussing her autobiographical documentary, He Named Me Malala, with Rothkopf. The podcast can be accessed via iTunes. Update at 4:24 PM: FishbowlDC has been informed that instead of Malala Yousafzai, the first Great Thinkers podcast will feature documentary filmmaker Joshua Oppenheimer and author David Rieff. Oppenheimer and Rieff will be interviewed by FP’s Amanda Silverman.